Russia made a winning start to this season’s Channel 1 Cup, recovering from an early setback to defeat Sweden 3-1 in Moscow. Fredrick Pettersson, who spent last season in the KHL with Torpedo and then Dinamo Minsk, opened the scoring at the VTB Arena in the 10th minute, but it wasn’t long before Sergei Kalinin tied it up. Kalinin then got the go-ahead goal midway through the second frame, and Nikita Gusev converted a penalty shot to seal the win early in the third. Metallurg goalie Vasily Koshechkin got the nod as the starter for this one, and recovered from allowing an early goal to keep Sweden at bay. Sweden had won its two previous Channel 1 Cup games in Moscow, but not even that early goal could disrupt Russia’s play – as Sergei Plotnikov told journalists after the game. Plotnikov also brushed aside criticisms of Russia’s power play, pointing out that Gusev’s penalty came during a PP situation, and Kalinin’s second hit the net as a Swedish player was emerging from the sin bin. 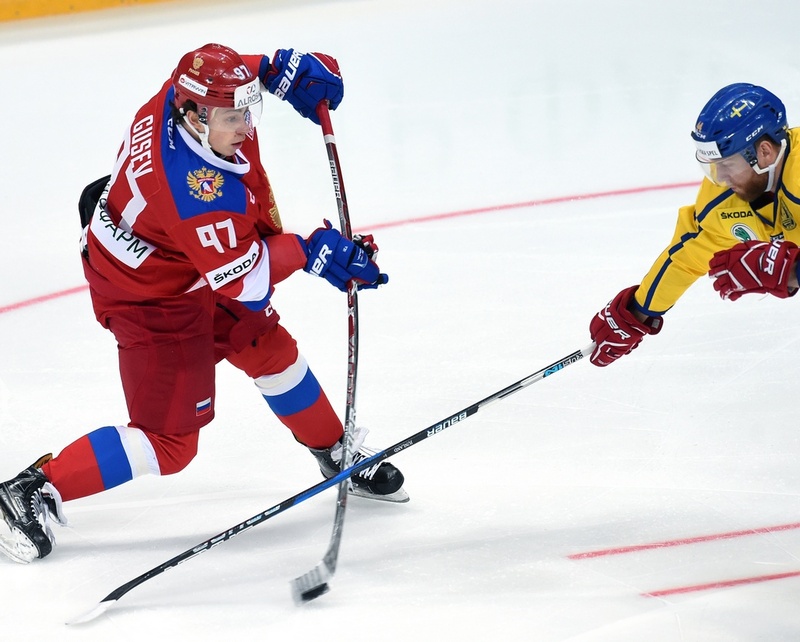 Russia’s next game in the Channel 1 Cup is Saturday’s eagerly awaited match-up with Canada. The Canadians, though, got off to a slow start before edging Korea in Moscow on Wednesday evening. Despite taking an early lead through Barys forward Matthew Frattin, Canada found itself 2-1 down at the first intermission. With five Kims in the roster, it was hardly surprising that San Wok Kim scored both goals, nor that Ki Sun Kim assisted both times. At the other end, former Neftekhimik goalie Matt Dalton, now a naturalized Korean citizen playing in the Asia League, was doing well against a KHL-heavy Canada roster and a shock result did not seem out of the question. Canada rallied in the second period, with a goal from Dinamo Minsk’s Marc-Andre Gragnani tying the game before Wojtek Wolski celebrated his return to Metallurg Magnitogorsk by potting the go-ahead goal in the 33rd minute. But, for all Canada piled on the pressure – managing 57 shots on goal and allowing just 10 – it wasn’t until the last minute that Quinton Howden’s empty net goal made the game safe. Lokomotiv forward Max Talbot reckoned that Canada did OK in the game after a slow start and was happy with his contribution after returning from injury. But for Barys’ man Linden Vey, the upcoming game with Russia was the one to look out for. “It’s a red-letter day for us,” he smiled. “It’s always a big game, no matter where the teams play, or what tournament. I’m sure it will be great. Wednesday’s other game, played in Prague, saw Finland cough up a 2-0 lead and suffer a 2-3 overtime loss to the Czech Republic. The Finns, unbeaten on home ice in last month’s Karjala Cup, began in the same vein. Sakari Manninen and Salavat Yulaev forward Joonas Kemppainen scored in the first period and that lead held until the 53rd minute. Then came Martin Ruzicka. The former Amur and Traktor forward grabbed a dramatic late hat-trick to steal the verdict for the Czechs.